Today’s guest on the BRAND new you show is Susan Chritton. Susan is a Master Personal Brand Strategist, Executive Career Coach, and Master Career Counselor. She loves guiding professionals who are looking to engage their authentic self through personal branding by identifying their uniqueness and arranging the variables in their life so they can transition from who they’ve been to who they want to become. Susan is the author of the book Personal Branding For Dummies which is what we spend most of our time talking about on the show. One of the first questions Susan and I discuss is the “need” for personal branding, specifically, how do you know when it’s time to start working on your personal brand. Susan suggested the following “symptoms” are all excellent indicators it’s time to work on your brand. If you want to be noticed for the work that you do. If you believe others should recognize you for your work, but you feel like they don’t. You work really hard and believe that people will notice. While these symptoms are what you may notice, the reality is by the time you see them, you should have already been developing your brand. Personal branding is for everyone and should be practiced by everyone. One of the first questions people ask themselves as they start looking at their brand is “what is my personal brand? This is a very crucial question and one that takes the longest time to answer. 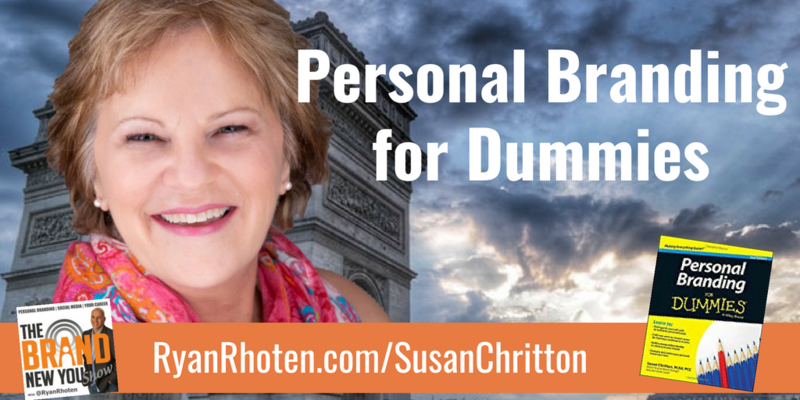 In part two of Susan's book, Personal Branding for Dummies, she provides readers with many different ways to identify their brand. When working with clients for the first time she spends most of their time together working through various exercises to help them define their brand. One key point Susan makes about defining your brand is that you need to be in a place in your life where you’re ready. You need to understand the importance of building your personal brand and how you can use it to benefit your career. How do you know you are ready to develop your personal brand? Something has not gone well in your career. You are dissatisfied with your place at work. You feel stuck at your level, and you are ready to break free to the next level. To help her clients create their brand, Susan takes them through exercises relating to their needs and their values, both of which are important when creating your brand. Susan usually has her clients start by reviewing a long list of values and circling the ones that resonate the most with them. From there they narrow their list down to the top five. In addition, Susan has also been using the Values In Action exercise to identify the internal strengths that motivate you. These values are below the surface, but they motivate you in everything you do whether you realize it or not. You can learn more and take a free assessment at Viacharacter.org. Mastering new skills, topics, and bodies of knowledge, whether on one's own or formally; related to the strength of curiosity but goes beyond it to describe the tendency to add systematically to what one knows. Thinking things through and examining them from all sides; not jumping to conclusions; being able to change one's mind in light of evidence; weighing all evidence fairly. While these exercises may seem trivial, the purpose of these exercises is to help you determine what is important to you as an individual. Once you know and recognize these values, you can begin to use them as goal posts or filters as you look at accepting new opportunities or moving to a new company. Sometimes we have a tendency to run away from situations at our current company and right into the same situation at a different company because the roles are similar. However, we can avoid these situations by understanding and aligning our strengths with our next position. The physical requirements for survival such as breathing, water, food, shelter. The need to be/feel safe and secure personally, financially, and emotionally. The need to have relationships where you feel like you belong such as friendships and family. These needs relate to our ego and generally mean we long for recognition, status, importance and a sense of respect form others. The ability to reach our full potential. To accomplish everything we can and become the most we can be. These needs drive our expectations and our mental framework that provide us with a solid base for our personal branding efforts. Another exercise Susan uses with her clients is the Strengths Finder 2.0 assessment. Susan believes our personal brand must be built on our strengths, both our internal and external ones. This is the only way you can create an authentic brand. Your strengths are your natural talents, they are the things you gravitate towards whether you realize it or not. They provide the foundation for your personal branding efforts and give you guidelines for building your personal brand. You can read more about Strengths Finder 2.0 in this article I wrote analyzing my strengths. Once you know your strengths, it's important to ask yourself when in your career do you get a chance to use your strengths? Rather than an elevator pitch, or personal brand statement, Susan likes to help her clients create a personal brand commercial. You use your commercial when you introduce yourself to people for the first time. Susan has a “formula” for creating your commercial. However, she suggests asking yourself the following questions as you begin to put your personal brand commercial together before diving into the formula. What does your target audience need to hear from you? How are you the same as your target audience? What strengths do you want to emphasize? What do you want to tell them about yourself? I know I’m in my element when? When are you awesome? People recognize my expertise in? People comment on my ability to? What sets you apart (freak factor)? I like the idea of a commercial instead of a pitch or statement. A commercial allows you to change your introduction based on who you are speaking to at any given time, whereas, pitches or statements can come across like a canned speech.